Please come along if you can, we'd love to meet you. We're not able to come to Wollongong, I'm sorry. After Canberra we go west again. Everything is going well. Last night we had dinner with my adorable editor and friend, Jo, and her husband Eli. I hope to have the time to do an update post tonight. I'll be at Dymocks, Readings and The Avenue in Melbourne next Tuesday afternoon. I'll have more details about times on Monday. On Friday 2 March at 12 noon, we'll be at Bathurst, Books Plus at 157 Howick St.. I hope our western friends can come in to meet us. Hello everyone! We're still in the Blue Mountains and yesterday Hanno, Tricia and I drove out to the little heritage town of Millthorpe. It is a beautiful town, untouched by modern development with many old homes and shops. We had lunch there and came back via Bathurst. A lovely drive. Today I'll be on 2GB Sydney radio with Chris Smith, talking about the book. After that, we'll drive over to Glebe to sign books at Gleebooks on Glebe Point Road. We'll be there from 3pm so if you're in the neighbourhood stop by and say hello. We'd love to meet you. Kerry and Sunny are at our place at the moment. Sunny's mum and sister and her children are visiting from Korea so they're there too. Yesterday they went to the mall at Maroochydore and saw my book on sale at Collins book shop. Kerry took a photo of it! I loved that he did that. My whole family is proud of this book and while I have been thinking of it as my book, I now know it's our family book. I hope to see you somewhere along the way. It would be great to put some faces to names. Most Australians know Wendy Harmer - she's a crazy-mad comedian who has made us laugh on various programs on TV and radio for many years. Just between you and me, I think she and I would get on very well; I have my crazy-mad moments too. In addition to all the other things she does, Wendy has a great web site called The Hoopla. Megan from The Byron Life has written a review about my book on The Hoopla and another one on The Simple, Green, Frugal Co-op. I have to admit, it's a bit strange reading about yourself, but it's all part of this journey Hanno and I are on and I'm thankful that it is bringing so many lovely people our way. We're relaxing at Tricia's now. My good friend Susan drove over from Mudgee today and we all went out for lunch. The weather is cold here but this afternoon sun is streaming into the backyard and it's inviting me to go outside to sit for a while. Tomorrow is the big day - the publication date for the book, it's been a long time coming. If you've bought the book, I hope you're enjoying it. And if you're in Australia, watch Today Tonight tomorrow night. The crew was at our home last week and that report will be on tomorrow night's program. We're almost ready to go. The house sitters are here, we have enough cat food for Hettie, I've just watered the plants, we've said goodbye to the neighbours and after a snooze tonight, we'll hit the road. First stop - Megan @ Byron Bay. This morning was full on again with a crew from Today Tonight here. What a great bunch they were - Adam, Brett and Nick. 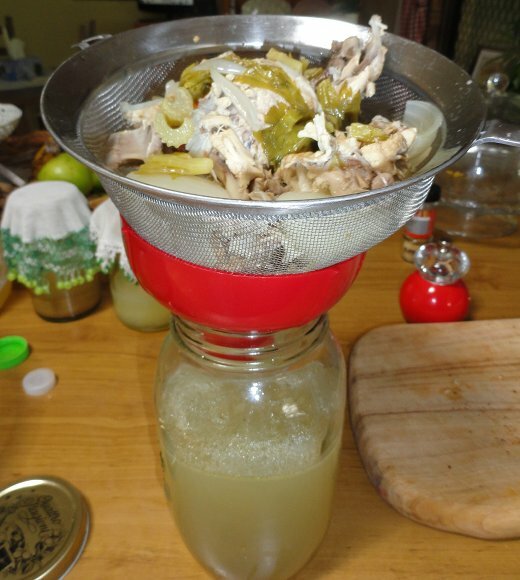 And they had a real interest in growing food, fermentation and Nourishing Traditions! I really enjoyed having them here. I still can't quite believe we're setting off on a book tour. I think back a few years to the beginning, when I sat on the front verandah and wondered if closing my business was the right thing and if a couple of ageing hipster doofuses could really grow food and keep chickens alive and productive. It all seemed so difficult from that end, but right now, looking back on it, just the thought of it makes me smile. It has been a wonderful and remarkable journey that made me a different, and better, person. It also brought with it many friends and for that I'm very grateful. 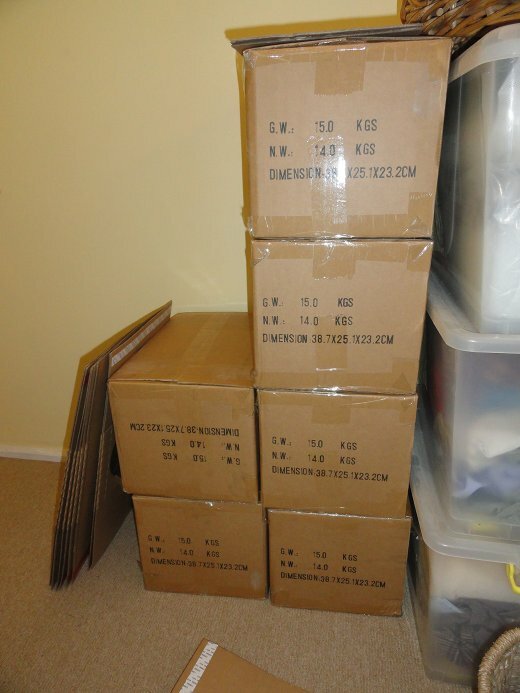 We've sent out all the books that were paid for so I hope yours arrives soon. I would love to know what you think of it once you've had a chance to read it. I hope we meet many of you on the road. I'll be updating the blog and taking photos as we go. Every book stop will be part of this record and presented here when we return. See you soon. 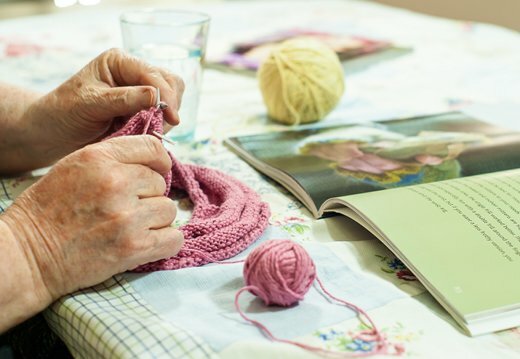 Cloth is an online UK magazine that has pages of projects, free for the doing. 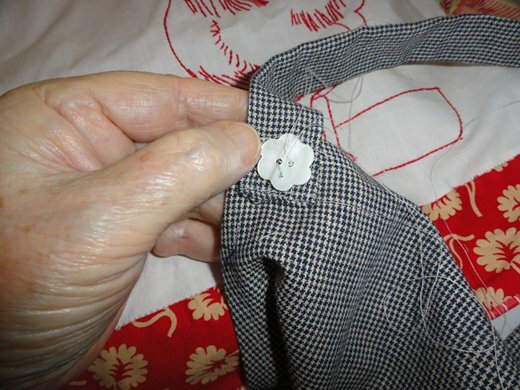 I particularly like this one - how to make a new ironing board cover. Family debt in the UK has risen 50% in a year. Welcome to all the new visitors who have continued to stream in since yesterday. It's heartening to see so many people trying to live simply and cut their costs. I hope you find information and recipes to help you in the archives. I will try to make another post this afternoon before we head off. I went to a long meeting at the Neighbourhood Centre yesterday. It was a three hour planning meeting to decide what we'll be doing this year and how we'll pay for it. We'll continue to offer our regular services like emergency food for people in need, food, laundry and showering facilities for the homeless, room hire, counselling services for victims of domestic violence, family support through one of our wonderful partners, my workshops and many other things, but we have to concentrate on fundraising too. We get a small amount of funding from our local Council which pays some of the operating costs but we have to come up with the rest. We are a registered charity, so all donations to us are tax-deductible but we have to sell ourselves alongside other local charities in a depressed economy - it's not easy. On Monday, we had a crew here from the TV program Sunrise. That will be on TV this morning at 8.50am - channel 7. There will be another crew here tomorrow. I'll let you know more about that after they've been here. I'm sorry to go on and on about the book but at the moment its filling up our lives. 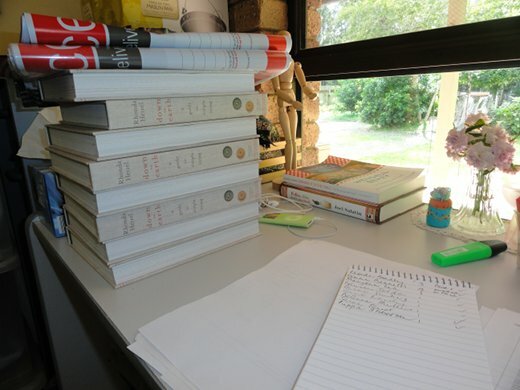 Today I'll finish signing the books I have here and Hanno will take them to the post office to send them on their way. I hope I have time for a haircut this morning and then I'll start packing for our trip. It's a bit of a balancing act to include as much as we need, and have clothes for hot and cold days, without going overboard and taking too much, or leaving behind something we must have. There will be the usual weekend reading post tomorrow and then we'll be off. I'm taking my laptop and camera with me so we can keep in touch on the road and show you what's happening and where we are. I hope you enjoy the trip. If you're wondering if I'm out gardening or baking or knitting. The answer to all is "no". This is what I'm doing and I think I'll be doing it until I pack it all up to go to a meeting this afternoon. Signing books is not hard work, but it's repetitive. Don't get me wrong, I am really grateful to have the opportunity to sign books, but at the moment there are a lot of books to be signed, packed and posted. If you have ordered and paid for a book, I'll probably be in touch sometime today. We hope to do the mail out tomorrow. We'll be hitting the road on Saturday morning and driving to Byron Bay to have breakfast with Megan who will do an interview for her local newspaper, The Northern Star. From there we'll head to Tricia's in the Blue Mountains where we'll rest for a couple of days after a very hectic week. I don't have the itinerary yet but this is where we'll probably be: Sydney, Melbourne, Ballarat, Castlemaine, Bendigo, Albury-Wodonga, Canberra, Wollongong, Springwood, Blackheath and Bathurst. The Queensland launch will be at Rosetta's in Maleny when we come home again - their link is on my side bar. I'll have more details for you when I have them here. Hanno and I hope you come to see us if you're close by. We are driving and not flying, as is the custom, so we can meet you, not just because of the book but because we feel connected to so many of you. Let me know if you can meet with us. And if you're in between those towns on the main route and there are a couple of you, maybe we could stop to meet you in the library or the local park. Luckily we have friends who are housesitting, so I have a bit of organising to do yet so they'll be comfortable while we're away. Think of us on Saturday morning as we choof off down south. It's going to be a memorable few weeks. 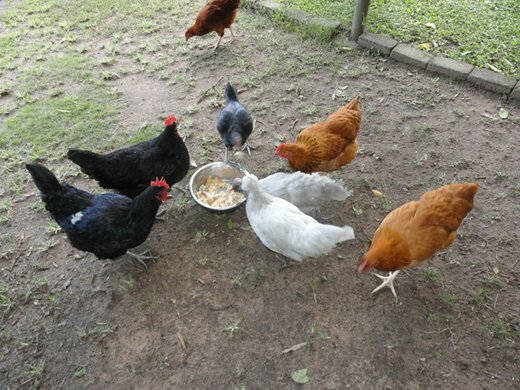 Backyard chickens will remain in good health if you give them a variety of good food but it's also worthwhile to see if you can reduce the cost of chicken feed while providing healthy food for your flock. To get a good supply of eggs, chickens need to eat high protein food. Most people feed commercial poultry food, either pellets or mash, but if you can add green leaves, table scraps, grains, stale bread or toast, and give them access to insects and worms you'll keep them happy and healthy while reducing the cost of keeping them fed. A good way to provide insects is to leave a couple of logs or tree branches around - untreated and unpainted. Keep them moist just by spraying them with the hose and over the months, as they start to decompose, they'll attract all sorts of bugs. Turn the logs over for the chooks every so often and watch them search for tasty morsels. 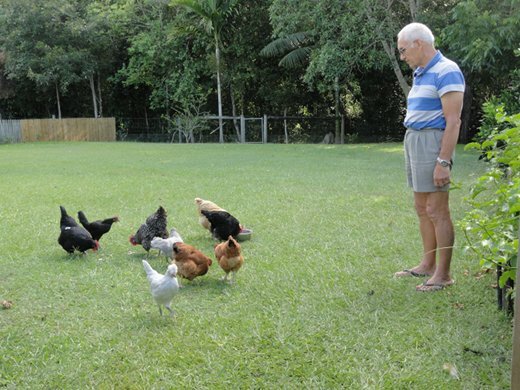 One of the easiest things to do is to have your chickens free ranging on grass that has not been sprayed or fertilised. The chicken droppings over the course of the day, and rain fall, will add to the fertility of the soil and the richness of the grass. Grass contains Omega 3 oils and if your chickens eat grass, there will be Omega 3 in the eggs you eat. Omega enriched eggs are very expensive at the supermarket so creating them in this natural way will save you money and give you healthier food. It will also reduce your feed bill. 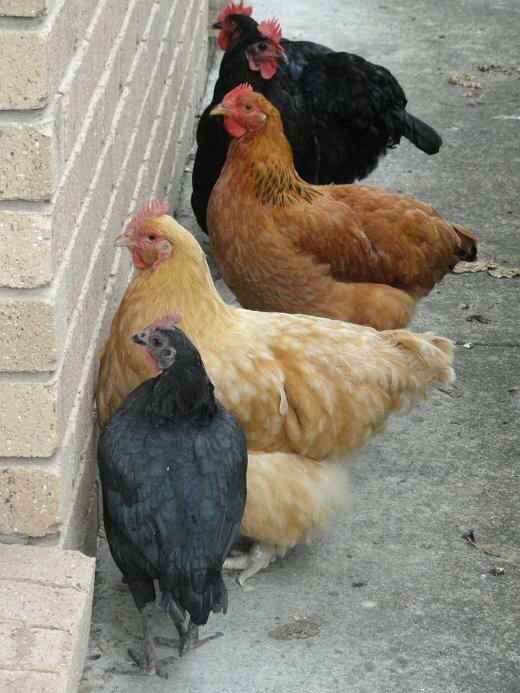 As a general guide, fully grown chickens need about 120 - 150 grams of food a day. Larger breeds need 150 grams, smaller hens eat less. There will be instructions and guidelines on the side of the feed bag so be guided by that. I find that some chickens are hungry eaters and some are not. Our newly acquired New Hampshire and Barnevelders fight for food, even though they have the same access to food all day. 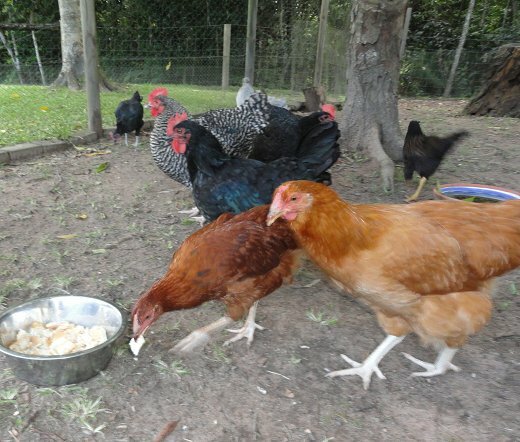 If we give meat scraps to our girls, those four chickens run in and out of the others, scanning the ground for food and will peck it out of another chooks' beaks if they can. Hanno asked for the bread crusts and ends when we were at the Bunya Festival the other day. He brought them home and mixed them up with a bit of milk. The chickens love this kind of food, it adds more protein to their diet and it keeps feed costs down. Small chicks need starter mash, they don't eat the same food as the laying hens. If you're buying chicks, ask the breeder what to feed them and if they need "starter crumbs" that is found at the local produce store. Small chicks can eat any of the supplementary leaves and porridge I've mentioned. If you have a vegie garden, pop in a few more plants that will suit the chooks. They love green leafy vegetables like silverbeet/chard, lettuce, cabbage, kale, spinach and all the Chinese greens like bok choy, wombok and tatsoi. They also love radish tops and turnip greens. If you have a large parcel of land, grain and seed crops include corn, amaranth, sorghum, millet, wheat, oats and sunflowers. If you're in a warm area, pigeon pea is good too and best to pick it when it's green. They will eat the peas and the foliage. 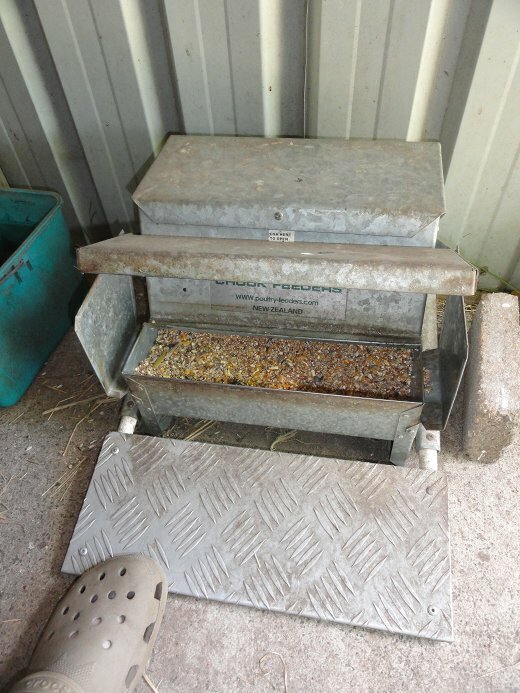 This is the feeder we have for our chickens. When they stand on the step, it lowers and at the same time, opens the lid revealing the food. The chickens soon learn how to use it and although it's supposed to keep rats away from the food, the rats learn how to use it too. Don't feed your chooks raw eggs because it may give them a taste for those lovely eggs sitting in the nest. 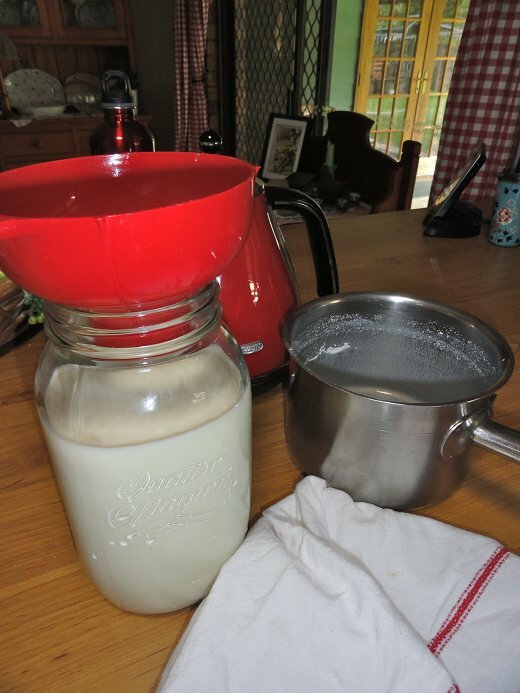 But they can have boiled or poached eggs and they will love you for giving them milk, whey, yoghurt or cheese - you can mix all these in with bread, toast, oats, rice etc. 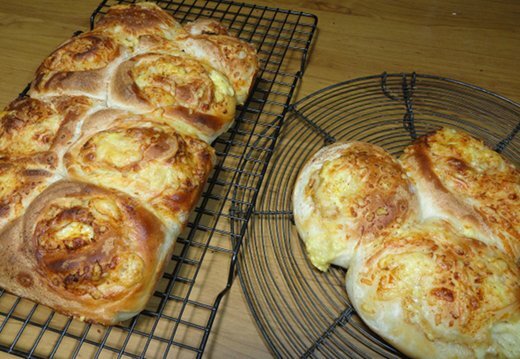 Make sure the cheese is not mouldy but stale or dry cheese is fine. In winter, we feed our chickens warm porridge with milk. They love this, it warms them up on a cold winter's morning and it will help keep their protein levels up to keep you in eggs during the colder months. Chickens always need fresh water. They will die without it. Give them fresh water every day and make sure they can access the water whenever they need it. Chickens graze and drink all through the day, they don't have set meal times like dogs and cats, so make sure their food is freely available to them and they'll return to it when they need a top up. Bring to the boil and simmer for five minutes. Cool, then decant to clean bottles. 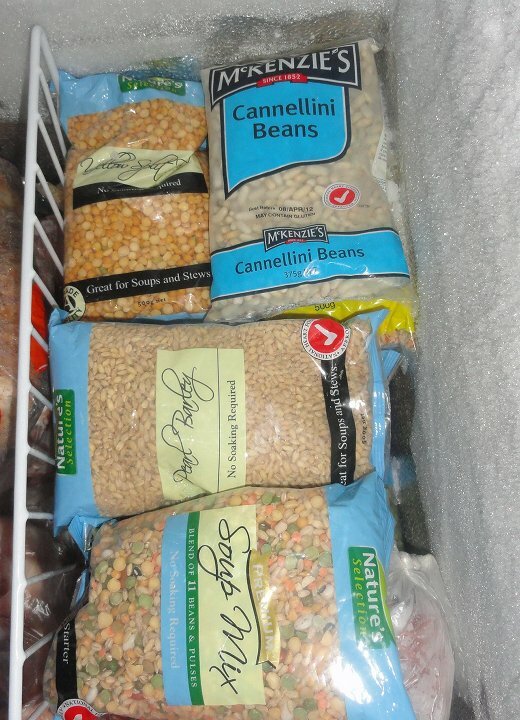 Store in the fridge for up to two months or freeze in a plastic bottle. The chickens we got from Julie in December are growing very well and are still in excellent health. I expect one of the New Hampshires to start laying in the next week or so, her sister should follow soon after that. I know that because their combs and wattles have grown in the past few weeks and they're now red - a sure sign of fertility. We've had to buy eggs recently because the old girls haven't laid much during the hotter months and the new girls are not ready yet. When they start up again, we'll have more eggs than we can eat and we can give some away. Feast or famine. If you keep chickens, I'm sure you know what I'm talking about. I've had several emails from people saying that Fishpond have told them the book will be released later in the year. Some say April, some say July. I spoke with Penguin this afternoon and I want to assure you that the book will be published on Wednesday 22 February. Nothing has changed. I would advise everyone who has received an email like this from Fishpond to email back asking what the problem is. And please let me know the outcome. Thanks. Hanno and I have been unusually social these past couple of days. Last Thursday we went out to lunch at a newly renovated and reopened local restaurant, Daisy's Place. Not very frugal, but Jens and Cathy gave us a gift voucher for lunch there for looking after Koda while they were away. The restaurant has an interesting history behind it and is now a beautiful place to dine while being surrounded by rainforest. Both Hanno and I were really impressed by the service and the food. The wait staff were very friendly and they knew their menu - that's aways a good sign. And the food! We both had fish and salad and it was fresh, delicious and beautifully presented. We went over to the dessert cabinet and while we were making our selection I heard: "Hello Rhonda". I turned around to find Vanessa Rumble - it turned out that she is the manager there. I introduced you to her blog a while back. Vanessa's husband Nathan was best man at Shane and Sarndra's wedding. Vanessa and Nathan are such lovely people. Vanessa told us that Nathan will be head chef there starting next week, so we'll have to go back at some point. We also met the owner, Sue Joseph. It turned out that she had a reservation to dine at Shane's restaurant, Absynthe, on Saturday night! What's that thing about six degrees of separation? It's been such a long time since I've been to a restaurant where everything was good, but that was the case at Daisy's Place. If you live here or visit the Sunshine Coast, you have to go there. Baroon Pocket Dam 8am Saturday. 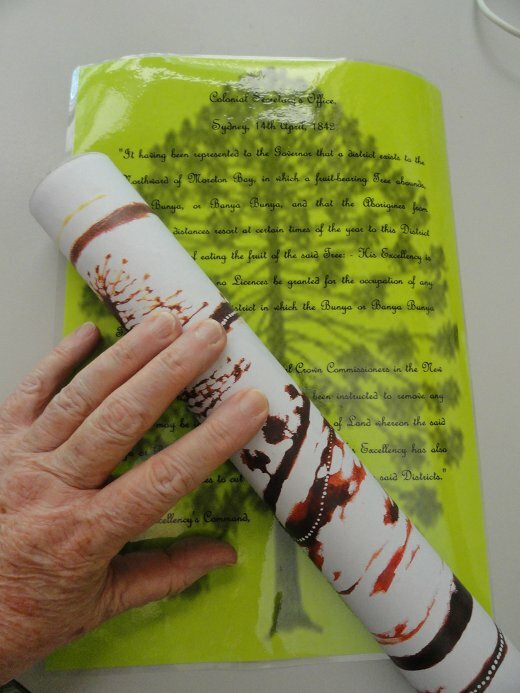 This year's message stick contained an invitation as well as a reproduction of the protection order from the Governor in 1842. The order recognised that Aboriginal people gathered to eat the Bunya nuts and stated that the land the Bunya pines grow on must not be settled on nor the trees cut down. On this past Saturday we had the pleasure of being at the Bunya Festival. If you've been reading here for a while, you'll probably remember my good friend Aunty Beverly Hand. 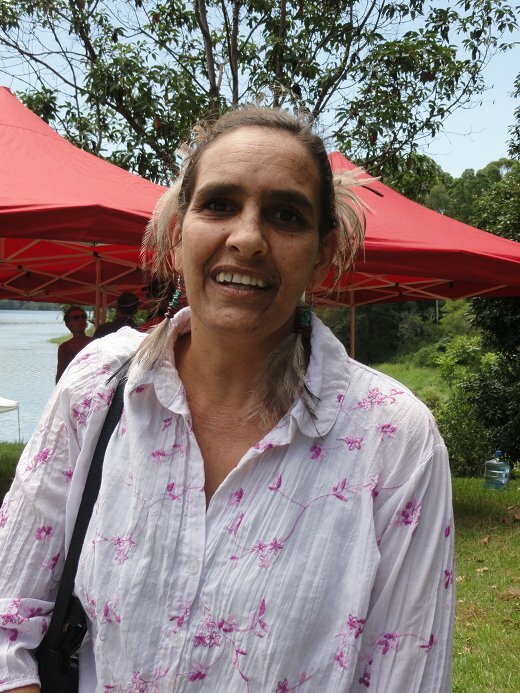 Aunty Bev is an elder of the Kabi Kabi people; the Sunshine Coast is their traditional land. For thousands of years, Aboriginal people have met when the bunya nuts are abundant to feast on them, for sporting competitions, to talk about justice and politics and to socialise. 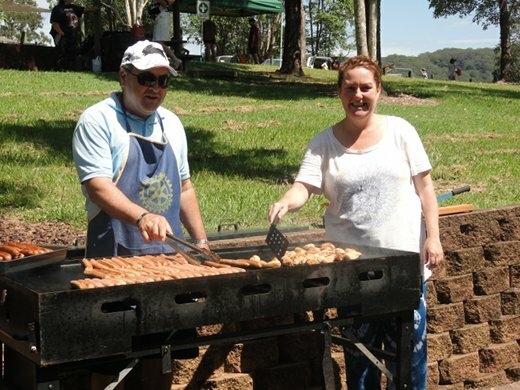 Aunty Bev started the Bunya Festival in 2007 and the Maleny Neighbourhood Centre, funded by the festival, prepares and serves the food. It's simple fare - roasted bunya nuts, sausages on bread, scones and jam, fruit, tea, coffee and water and it's all provided freely to everyone who comes along. It's an invitation only event - and invitations for family groups arrive by message stick. 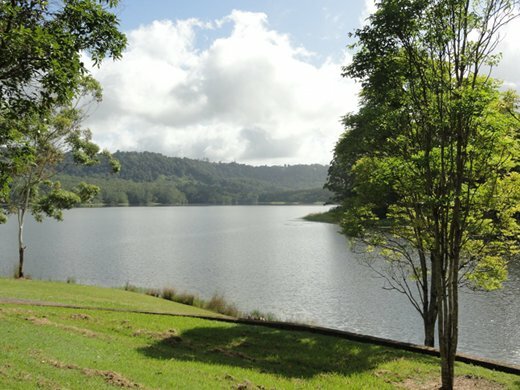 Hundreds of people come along and enjoy a wonderful alcohol-free family day in the sunshine, on the banks of the Baroon Pocket Dam. Large pieces of art work were scattered around the picnic ground. 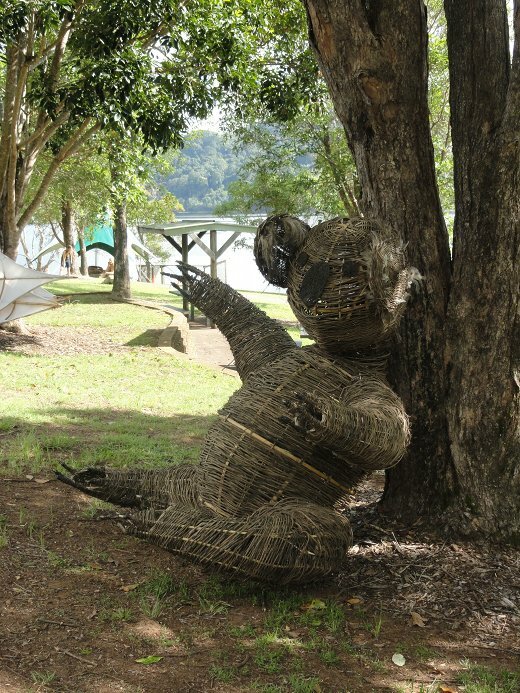 This one is a wicker koala. 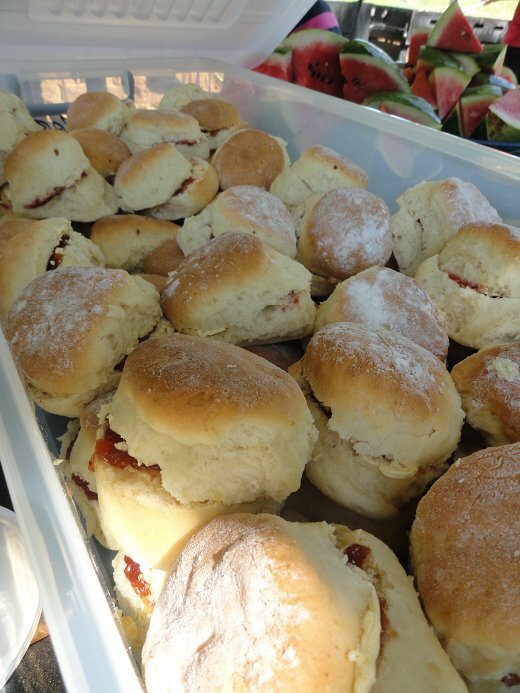 This was one of my jobs - I coordinated the food workers and prepared the scones for morning tea. I also walked around the crowd and told people to go and help themselves to whatever they wanted to eat. It was all free, which surprised some folk. It is the custom of the local Aboriginal people to share whatever food they have with everyone who comes along. Non-indigenous Australians are surprised by this and I really enjoyed inviting them to accept the hospitality offered by Aunty Bev and the festival organisers. Local Maleny High School principal, Brian King with our new community development worker Chris, cooking sausages and roasting bunya nuts for lunch. 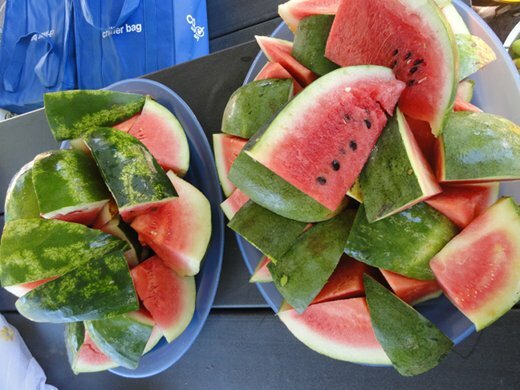 Fruit was laid out so everyone could help themselves. 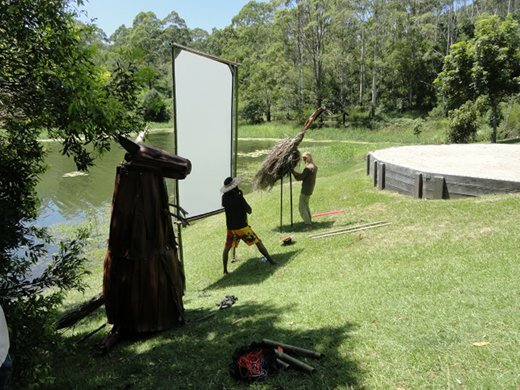 Kangaroo and emu being erected beside a screen and stage. 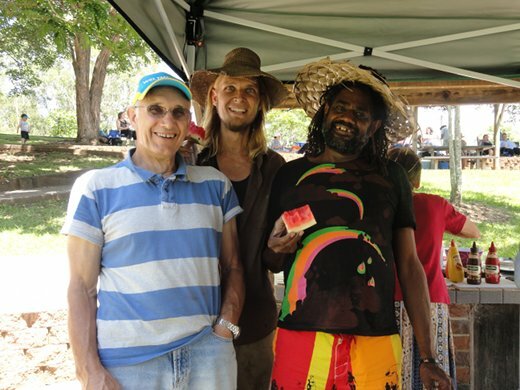 Hanno with some of the workers at the festival who enthusiastically took up the offer of cold watermelon for morning tea on a hot day. Aunty Beverly is one of the most interesting people I've ever met and I feel honoured to call her my friend. She is a kind and generous soul and when it comes to native flora and fauna, and the sensible management of our land, she's like a walking encyclopaedia. The festival started with Aunty Bev talking about the history of the Kabi Kabi people, the land and her own family history. Sadly, last year, Aunty Bev's mother died. She was a shining light for everyone who knew her. Like Aunty Bev, she was a gentle activist, a teacher and a good family woman. There was a tribute to her at this year's festival and that gave everyone there a chance to honour and remember a great woman who made an enduring mark on her people, her family and her land. It was a delightful day full of art, competitions, challenges, feasting and socialising. I have never been to another event that warmly accepts and embraces people in such a wonderful way. It was a pleasure for Hanno and I to be there. FYI: It is a mark of respect in Aboriginal culture for an elder to be called either Aunty or Uncle. It is a title given to those who work with their people to help strengthen families and communities. It is also a sign of respect for the name of a person who has died not to be spoken or written. It is out of respect and love for my friend Aunty Bev and her family that I uphold and honour these customs. Over 600 delicious looking vegan and vegetarian recipes. Well worth a visit. Owlet - a charming blog about family, life and food. It's Pickles again - this time, the Cool Kid Hooded Hat. It's perfect for those babies and toddlers who keep pulling their hats off. This free pattern is available in all sizes. The Many Australian Photographers Group - a series of photos of the drought. Inspectapedia - a free encyclopaedia of building and environmental inspection, testing, diagnosis and repair. A must see for the home handyperson and whoever does the maintenance in your home. Includes winterizing your home, how to determine the age of a building, water pipes, stain diagnosis, roofing inspection and diagnosis, insulation inspection and improvement, common indoor air pollutants, and much more. How tourists are helping to save the Tasmanian devil. I am currently reading Wendell Berry's wonderful book Bringing It To The Table. This is the first Wendell Berry book I've read and wanted to see more and know more about this intelligent and inspiring man. I found this - Wendell Berry discusses life. It's Friday ... again. Time to sit back and enjoy the end of summer, or if you're in colder parts of the world, the end of winter. Soon you'll see the beginnings of spring. Have a lovely weekend. Thank you for your generous and beautiful comments yesterday. We both loved them. I'll be posting our itinerary as soon as it's ready. I know for sure we'll be in Melbourne for The Circle, Ballarat, Canberra, Wollongong and the Blue Mountains. The rest of it is not quite ready yet but when I have it, I'll post it. I have written quite a bit about change in the past six months but those changes have been more about a move towards simplicity and sustainability by many people, right here in Australia, and all around the world. I think that's a wonderful change, and when I was slogging away on my blog in 2007 and 2008, I never believed that we would be at this point just a few years later. All of it was pushed along by the GFC and while that was a disaster for many, and continues to be now, it is also the pendulum swinging back towards thrift and prudence after years of rampant consumerism. Today my topic is change, but it's about a change of attitude. When we were starting out, I found that adjusting my attitude made the difficult changes that were to follow, much easier. We all change in different ways, but many of us have to come to terms with our debt and to become more frugal in our habits. That often means giving up things you're used to having and sometimes doing that is painful. We gave up pay TV, our second car, buying books, magazines and newspapers, eating out and other things along the way. When I look back on that time I remember wondering if we were doing the right thing or if it was pointless. Now I know that for us, those first small steps not only gave us the strength to dive into bigger changes but they also made money available for things we needed, not wanted. Okay everyone. Stand up, face the wall and don't move. I was over-ripe. I was ready for change and nothing could have stopped me. But I think our changes seemed (now) to be easy because I was absolutely convinced that sacrifices were necessary. I had thought about how I wanted my life to be and when I visualised the future with nothing changing, I was saddened to see much of the same - waste and joyless shopping. I was disappointed in myself. For me, a change of attitude was vital and it helped all the difficult adjustments that followed. If you haven't had that change of attitude yet and you're occasionally slipping back into old habits, take some time to think carefully about why you want to live sustainably and simply. You want to move from "I deserve/want this." to "It would be great to have it but maybe I shouldn't." to "No, I want a better life. Let's get on with it." When you identify what you and your family will gain from the changes, something will click, you'll see different possibilities and you'll be in a different frame of mind. There is no doubt that being at peace with your reasons for change will make it easier for you. If you're not quite there yet, do some more reading, stop going to the shops and watching advertising, think about what your life could be and go ahead again. There is no one way to do this. We're all different, we want different things and we all come from different circumstances. A change of attitude is common to us all though, so if you can get there, it will be easier. 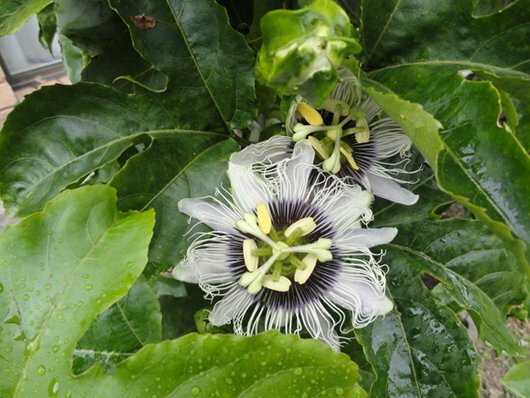 There will be passionfruit soon! I know now, with certainty, that our simple way of life will never come unstuck. This is us now and forever. We grow vegetables, bake bread, work hard, connect with our community, live easily with thrift and do as much for ourselves as we can. It's not a burden. We do it with open and generous hearts and all these things, have become our normal. It can be your normal too. It can all start with a change of attitude. I spent the last couple of days at Maleny working at the Neighbourhood Centre. Yesterday was very busy with a simple living workshop in the morning, craft from 12.30pm and a radio interview straight after that at 2.30. The next two hours were spent talking to various people who came in and taking phone calls. When I headed for home, I was ready for it. Walking towards the house, I could smell our tea cooking - Hanno's favourite, rissoles (big meatballs). Soon, we were sitting at the table eating those rissoles and salad, and with ice clinking in our water glasses, we told each other what had happened during the day. Hanno told me about a delivery of books and that reminded me that next week we'll be off driving around the country hopefully meeting many of you. I'm in two minds about this trip. I am an introvert by nature, an optimistic introvert, so wandering around the country meeting people I don't know is not something I'd generally look forward to, or even contemplate. But this seems right to me, even though it will involve many nights sleeping in unfamiliar beds and eating food made by others, I think it will be okay. Luckily we have friends staying here to look after the house, cat and chickens, so home will be safe even if we're not as securely tucked away as we usually are. Today I'll be tidying up and doing a few things to prepare for the trip. I'll also be replying to emails about book orders and making up a book plate to sign for those who want one. 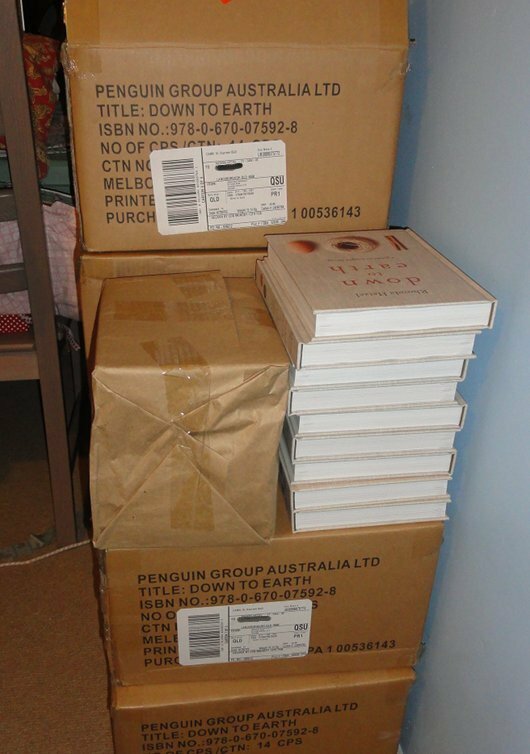 We have about 50 or 60 orders for books in Australia, so they have to be signed too. We'll start on that today so Hanno can have them packaged up and ready to post on the given day. I think I'll start a list too - a list of what we want to take away with us. That's the beauty of travelling by car and not by plane, you can load up the car with bits and pieces and have a little version of home travelling around with you. I find that very comforting because I am a homebody, I belong here. Out in the wider world, prices are rising, wars are continuing and change is a constant. When I hear about Madonna prancing around on a stage far far away, or a monarch's 60 year reign or drive by shootings or that grey is the new black, it feels like some other world; something unfamiliar. The domestic world of kitchens, ripe tomatoes, fresh eggs and clucking hens is my world. Being out there will be more difficult and more stressful but it also has the potential to be something I'll remember forever. I think it will live up to that potential. I wonder if I'm being too optimistic. Our solar panels at front and the solar hot water system further back. We have had a solar hot water unit for about 30 years. We had one on our old house and installed a new one when we moved to our home here. Solar hot water units still attract a government rebate in Australia and as hot water is one of the highest components of the electricity most of us use, it's a worthwhile exercise to save up and install one. 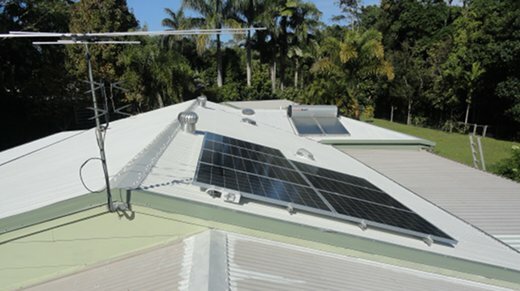 Information about solar hot water for Australians is here. I would love you to add comments about rebates in other countries. Half way through last year we went a step further; we had some money, and with the assistance of the government rebate, we had a small solar unit - 1.5 kW, installed. We got excited about it and had visions of working our way towards saving money on our electricity bills. Here in Australia, and probably all around the world, the cost of electricity, gas and water have been rising a lot. We thought that with prudent use of our appliances and by keeping a careful eye on what we were producing with the solar panels, we'd slowly work our way towards a credit balance on our electricity bills. That didn't happen. We were in credit on the first bill. Yes, $55 credit! I can still see it now. Hanno and I don't use a lot of electricity but we were not always like that. We slowly learned how to conserve this precious resource and we cut our electricity bill back to about $130- $150 per quarter, before our solar panels. In Australia most of our electricity comes from coal-fired plants so not only were we saving money if we cut back, we were saving carbon emissions too. Some of our strategies might help you and if you contribute to this conversation in the comments, we might come up with a pool of great ideas that will help people all around the world. I am aware that many of these things are common place, but it's worthwhile repeating them because a lot of this about about developing habits - and that comes from repetition. Printer/ Broadband Modem / Telephone all on standby but not used - $61. Home computer with printer on standby - $20. LCD TV, with DVD and PVR in average use and always left on standby - $45. You can read that article about electricity costs for the average Australian home here. 2. Read the manuals that come with your electrical appliances, especially those with cooling or heating elements, and use them according to the recommendations. For instance, the best temperature for cost effective cooling a room with an air conditioner is 24C / 75F. 3. During extreme heat, and depending on security in your neighbourhood, keep some doors and windows open at night to let the cooler air in and close them during the day. This works really well if you're home is insulated. 4. If you live in a country with a cold climate, make some window quilts to help keep the cold out and the warmth of the fire in. 5. Hang clothes outside in the open air instead of using the dryer. 6. Use the washing machine with full loads and in off peak times. Here is a general idea of peak and off-peak times. For more accurate times, google you home state's household electricity peak times. 7. When we have to replace an appliance, we look for the energy star system. We recently had to replace our fridge and after a lot of research we bought an Electrolux two door - fridge above, freezer below. We've been very happy with it and I have no doubt it helped us with that $55 credit. Info about energy stars her for USA, UK, Australia and NZ, Canada I tried to find European Union information but all I found were regulations (very frustrating). If you have a European site to share, please do so. 8. When you're baking, bake several things at once, or one after the other. That allows you to use the heat you've generated without letting the oven heat up and cool down for once batch. A wireless power monitor - you set this up in your home and it will show you how much electricity you're using at any time. This alone will help you save energy - you can see how much your washing machine is costing you and how much it goes up when you dry clothes in the dryer. A hot water system adjustment, if yours needs it. Water and power saving shower head. A customised power and water-saving plan. Hopefully a similar service is provided in other countries as well. Please let me know what government incentives are available in your country. 10. Replace your old light globes with compact fluros. These can be expensive but well worth the investment. If you're on a tight budget, buy one a month until you have all your lights covered. Concentrate on your big energy appliances first - dryers, heating, cooling etc. Moves towards reducing your electricity consumption are usually slow and it's one of those things that takes time to see improvements. But if you can make a plan to cut your usage, it will pay off because it looks like these charges will continue to rise in the future. Yesterday many of you shared your wonderful ideas by commenting. Please do so again and see if we can help others save both money and carbon emissions. If you were to cook your own meals from scratch, I doubt you'd add sulphites, nitrates, artificial colourings or flavours, gums or MSG, and yet they're common ingredients in foods on supermarket shelves. Some preservatives, like calcium propionate (282) in bread have been removed recently because of their effects on health, but there are many other additives remaining in the food we eat. These things are added to keep food fresh, to add colour, flavour and to replace certain food properties that are removed during processing. Some additives are harmless, some cause problems, some haven't been tested. If you buy processed foods or pre-prepared meals, it's a good habit to get into to read the labels and have some understanding of what you're reading. One of the ways we can get around this is to buy unprocessed ingredients instead of food that has be modified in some way, or already prepared and cooked. If you can make meals using ingredients you know, such as vegetables, fruits, meat, chicken, fish, dairy products, pulses and legumes, you'll be as close as you can get to eating and serving food you can be sure of. Instead of relying on packets of powdered spice mixes and cans of soup to add flavour to your food, get to know the herbs and spices you have available and use them instead. Chop, slice, shred your food yourself. Caramelise meat, chicken, onions and vegetables - that alone will add a lot to the flavour of your food. Make your own seasoning mixes. Find recipes here. Be careful with fruit juice as well. It's much better to grow your own or buy oranges and squeeze your own juice, but if that is not possible, read the label carefully and buy cautiously. There have been news reports last week about insecticides in orange juice imported into the USA from Brazil another country and processed in America. 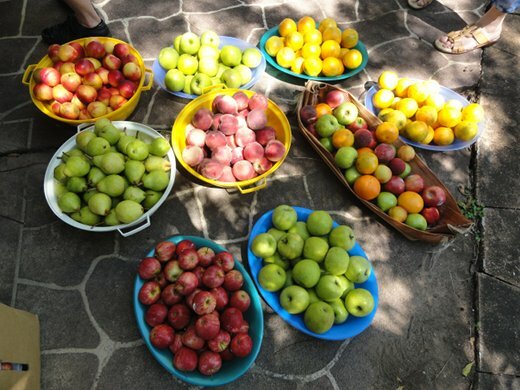 Buy in season; fruit and vegetables in season are usually cheaper and fresher. Buy cheaper cuts of meat, like shoulder of lamb or pork instead of the leg, and chuck steak, skirt steak, gravy beef, shin beef. All these cuts contain cartilage that break down with long slow cooking to give you natural gelatine in your food. That is very good for you. There's more to be read about this is the excellent book Nourishing Traditions. 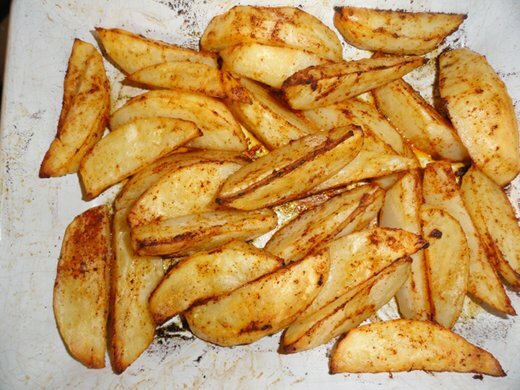 Use your slow cooker or a casserole dish in the oven to slow cook a double batch. Freeze the second portion. We buy our meat in bulk from a local family butcher. We usually buy a hind quarter of beef which will see us through several months. It costs $7.95 a kilo (2.2lbs) and is local meat from the butcher's own farm. Obviously that is the ideal and not everyone has that luxury but you can ask about the meat you buy. If you ask questions you'll learn more and will be less likely to buy inferior meat. Stockpile - this will support you cooking from scratch. A cupboard full of ingredients will see you through not only your daily meals and snacks, it will be an insurance policy for those times when you don't have the time or energy to shop, when you have increased expenses one week and run short of cash or if there is a community emergency such as a storm, flood or fire. Use your leftovers. Learning how to deal with leftover food can stretch one meal into two or at the very least will provide a lunch the following day. Take your lunch and drinks to work or school. “Don't eat anything your great grandmother wouldn't recognize as food. "When you pick up that box of portable yogurt tubes, or eat something with 15 ingredients you can't pronounce, ask yourself, "What are those things doing there?" Michael Pollan says. So if you eat grains for breakfast, forget the Corn Flakes, Coco Pops and Cherrios and go for oatmeal or semolina instead. Don't buy instant oats (or instant anything), buy rolled or cut oats or barley, soak them in water overnight and cook them in the morning. Cooking food isn't one simple task. It's a series of steps that will see you buying, possibly growing, cleaning, preparing and cooking the food you eat. How do you go about it? Can we turn this list of ten into 100 essential tips?